Home > Uncategorized > Events this Week! We’ve got some great events we’re doing this week while in Boston. On Wednesday, we’re doing a call-in phone interview with Elise Giddings of Cycle9. We met her on our way to Durham, NC. 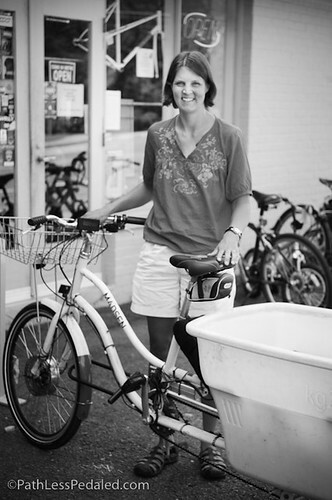 She has a great shop that specializes in e-bikes and cargo bikes and is active with promoting transportation cycling in the Carborro area. She can be often be seen zipping around town in a Madsen, an unlikely site in North Carolina. To join us on the conference call, sign up here. The call is on Wednesday, Oct 27th, 9PM eastern (8pm central, 7pm mountain, 6pm pacific). 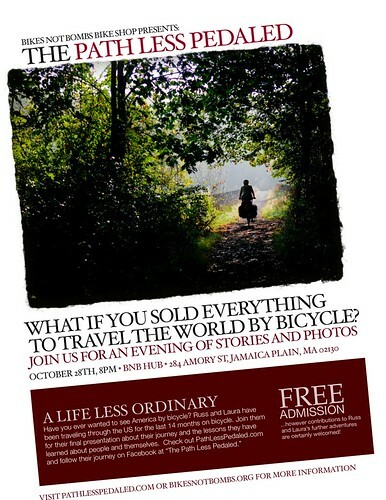 We’re also doing a presentation in Boston at BikesNotBombs HQ! The Facebook Event page is here, please RSVP so we can get a rough headcount. This will be our final presentation before we take a train to Portland, OR. And speaking of Portland, we’re really looking forward to diving into all the bikeyness in PDX. We’re already planning a presentation there and will also do some overnight bike camping trips. So stay tuned!